Some of the best weekend getaway trips take you from the world you're in — in this case, hot, sprawling Phoenix — to a completely opposite environment. The grandeur of Sedona's Red Rocks and its otherworldly vibe provide an ideal setting for a couple who need a change of scenery at only a two-and-a-half hour, 125-mile drive away. 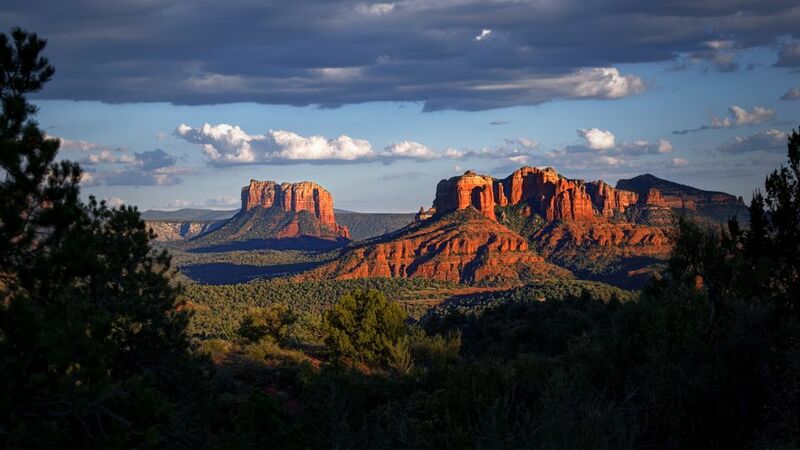 The journey through beautiful countryside as you approach Sedona — especially the magnificent Coconino National Forest along highway 89A — will play a big part in the weekend relaxation and decompression process. The town of Sedona is home to galleries, boutiques, an exceptional chocolate shop, and Oaxaca restaurant, which serves delicious and affordable Mexican and Southwestern fare. Anticipation also should be a major part of any romantic weekend getaway. And if you're made reservations at one of Sedona's top resorts, you won't be disappointed. L'Auberge de Sedona, with its individual creekside luxury cabins on 11 acres in a canyon by a stream, is my top choice in the area. Cozy and private, with a working fireplace and a bottle of red wine and two glasses awaiting your arrival, quarters at this French country inn don't disappoint. Couples whose idea of a relaxing weekend involves spa services are likely to be even happier at Enchantment Resort & Mii amo Spa, a secluded getaway surrounded by Boynton Canyon's red cliffs. Here, twosomes can engage in a couples' healing touch massage and shiatsu in the serene and private couples' suite with mountain views. Your bodies open to touch, your spirits open to the energy vortices surrounding Sedona, what could make for a more romantic weekend together? It would be a shame to live in Phoenix and never see the Grand Canyon, a natural wonder of the world practically in your backyard. The South Rim of the Grand Canyon is about a 250-mile drive from the city. It takes about four-and-a-half hours, which still makes it a reasonable distance to travel on a romantic getaway. One of the rules of a great escape is that you shouldn't have to spend all of your time in the car. So consider parking yours in Williams and boarding the ​Grand Canyon Railway. The train ride takes about two hours, and as soon as you arrive at the depot there's a box lunch and a bus waiting for you. It'll take you on a short tour, which allows time to photograph the Canyon. If you'd like, stay overnight in the historic El Tovar Hotel, a Grand Canyon landmark that opened in 1905. Freshened up, it's still the most luxurious choice for lodging in the park. The only thing to keep in mind about taking the train, booking a room at El Tovar, or visiting The Grand Canyon on a weekend is that this destination gets very crowded in summer. Reservations are a good idea at any time of year. But since you live so close, you don't need to travel when the tourists do. Steal away for a romantic weekend in fall or winter, and it just may feel like you have this miracle of nature all to yourselves. It's a short flight — about an hour — from Phoenix's Sky Harbor Airport to Las Vegas' McCarren Airport on Southwest Airlines and American Airlines. If you make reservations during one of the airlines' frequent sales, you can fly roundtrip for a small amount. Of course, you could also drive, crossing the 300 miles in about six hours — but why sacrifice the time when you only have a weekend? Either way, you'll be transported from desert to desert for your romantic getaway. And if you've got the spirit of fun, you're likely to find the Las Vegas desert a dazzling one. What's your pleasure: sightseeing in Las Vegas? Cocooning in one of the best hotels in Las Vegas? There's also shopping, gambling, eating at world-class restaurants, nightclubbing... and catching the shows. And if you're thinking of tying the knot during your romantic weekend in Las Vegas, well, you wouldn't be the first couple to say "I do" to its amazing wedding chapels. The best thing about visiting Las Vegas from Phoenix is that you don't have to choose: It's close enough and cheap enough that you can visit as often as you like (and can afford!) for an exciting romantic weekend.